For those who have been around JSA for a while, you may have seen my new visual recipe index that’s categorized properly and has a thumbnails now instead of just text (if you hover over the thumbnails, there’s text as well). The best thing about this method for a recipe index is that you don’t have to touch it after you set it up. The person who designed this plugin is a genius. NOTE: This tutorial is for those who are self-hosted and using WP.org software only. I don’t know if this works for wordpress.com or blogspot blogs. Step 2:Â Organize your posts into categories (you can use my page for a reference if you want, but feel free to go broader or more narrow if that’s what you like). Also, now that people are looking for gluten-free, dairy-free, egg-free, low-sodium, vegetarian/vegan, or other specific diets, feel free to place those posts into categories as well. (I only have gluten-free and vegan specific pages, but some others have paleo, sugar-free, etc. if it applies to your blog). If you were like me and didn’t do this properly when you started blogging two years ago, you probably have 200+ posts to categorize (or re-categorize, which is actually what I did). So, if that’s you, save this page for later, and I’ll see you in a couple days, unless you have a solid day to recategorize them all. If you’ve already done this, move on to the next step. Step 3:Â From your wordpress dashboard, go to Settings>Category Grid View Gallery and edit your settings. Step 4:Â Create a page for each category. Alternatively, you can just place every single category on one page, but that’ll slow down that page because there’ll be so many galleries and images bogging it down. Step 5:Â Generate the shortcode for each category. IMPORTANT: Make sure you uncheck the “Open in lightbox” option before you hit “Generate Shortcode”,Â you delete the category id highlighted below after you generate the code! Publish your page, and repeat this with all the other pages. This is what it should look like. To get rid of any bullets or in my case, the little purple hearts, see the Troubleshooting/FAQs section below. Step 7:Â Link all of your category pages to one full recipe page. You can do it like me and use labelled images, or you can just link it with regular text. 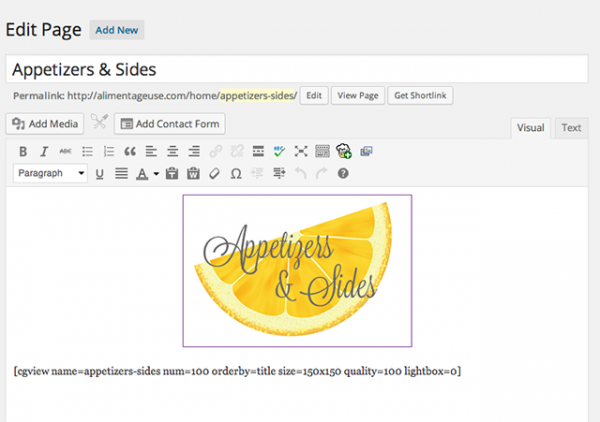 As long as you categorize future posts, they should appear in your recipe index in that specific category! If instead of showing a specific category, you’re getting ALL of your posts showing up, it either means you haven’t deleted the category ID bit, or you haven’t specified the category slug (You see what they are when you navigate in your dashboard under Posts>Categories. For example, my Cakes and Tarts slug is “cakes-tarts”. If your list isn’t showing up as a grid and instead a horizontally sliding bar, double check the settings of your plugin to make sure that you have the vertical pixel height as “0 px” so that the grid is dynamic and can adjust to however many posts you have. Also make sure that the horizontal pixel width matches the width of your content. Hey Lindsay! So if you look at my recipe page, I have a separate page for each category (Cakes, Entrees, Appetizers, Soups, etc.) For the shortcode generator, it's in the tab next to the settings for Category Grid (Step 3), and you fill out the form/check or uncheck boxes as I showed in the screenshot, and click generate short code!And I highly recommend Cameron. For serious. Hi Lisa! Thanks so much for this tutorial! Quick question, I used this tutorial, however instead of a grid it made this weird slider. Any thoughts? This is awesome. Thank you so much! I've been slugging along, trying to make a gallery of posts using a plugin where you have to manunally add each post and each image. This is a lifesaver! One question: why do you delete the Cat ID in the shortcode? Yeah I used to have that method too, and then I discovered this plugin haha. The Cat ID is basically a numerical value equivalent to the Cat slug (in case you ever change the title or the slug, then it's not affected). However, finding the Cat ID is a little more complicated than the Cat slug (I'm now noticing that slug is a rather unfortunate term for this haha) because as far as I know, the only way to find a category ID number is by hovering over it and looking at the ID number in the URL (but not clicking it). Too much hassle for me. Yay! I'm glad it's useful! That's a good question. I haven't found a way to do so through the shortcode or settings, but those more experienced may be able to adjust the plugin or add some CSS to make all new links open in a new window. If you have your heart set on having links open in a new tab, maybe try putting out a question on the plugin support forum? Hi Olivia! You generate the shortcode by selecting the different options, then click "Generate shortcode". Afterwards, the [code] will show up, you delete the category id number but leave the slug, and paste it into your content.Finding out the width of your content area depends on your theme. You may need to check your theme design to see how it's set up (you can check the CSS for content width) but I knew mostly because when I was first starting out as a blogger, I would resize my photos via trial and error to see how big I could get my photo to be on in my posts. Oh it looks like the plugin got removed from Wordpress. 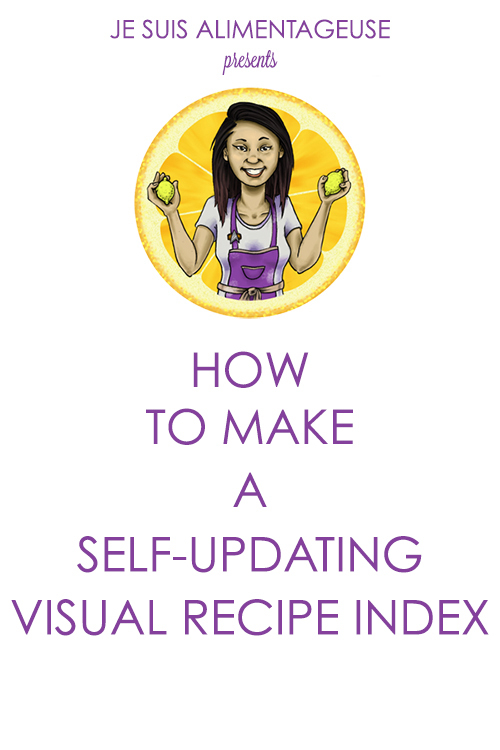 There's a new plugin called Visual Recipe Index, I'll post the tutorial for that tomorrow, but it's very similar to CGVG. Hi Lisa! Is this suitable for blogspot?? because my website is blogspot and not wordpress! Much thanks! carmen recently posted...Green Tea Cream Cheese Brownies. Unfortunately this is a wordpress tutorial. I'm not sure if blogspot supports plugins or not. Hi Ali! I honestly have no idea, sorry. I haven't used Blogger in years. http://www.slim-shoppin.com/recipe-index/Yeah! I've been looking for something like this for the longest time and this is by far the easiest plugin. I've had my site for 8 years, some in the beginning were never categorized or had featured images set, but if I chip away at it every day, I'll get there!Thanks for your easy instructions. I didn't have a problem at all!